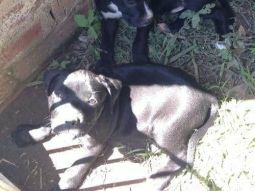 American Staffordshire Terrier breeders links and breed information on pups4sale.com.au. The American Staffordshire Terrier, or “AmStaff” as it's commonly called, is a medium-sized dog known for its unbelievable strength. What surprises many people to hear is that the AmStaff is actually quite intelligent and can be trained in no time at all. American Staffordshire Terriers and Pit Bulls have an unearned bad reputation throughout the world because they are used in dog fighting, but the fact is that this is a great breed because they love people and enjoy learning. They aren't necessarily for everyone, but they are nonetheless a great breed. 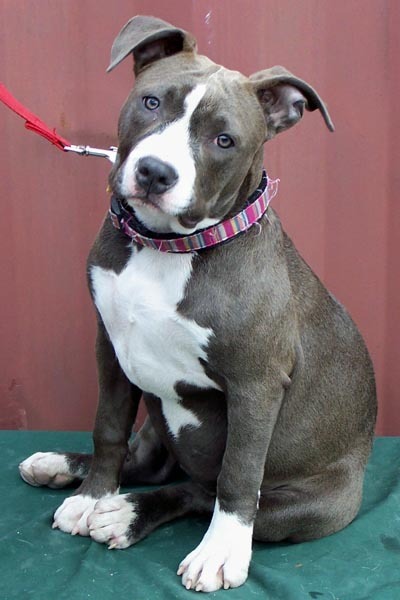 Male and female AmStaffs are about the same size, ranging from 17-19 inches and weighing 25-40 pounds. While this might not be a huge size, the muscle definition that AmStaffs have usually makes them look bigger than they actually are. 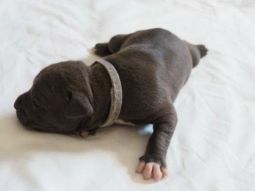 Thanks to DDD Amstaffs for the pictures of American Staffordshire Terrier puppies & adults used on this page, and the additional information provided. 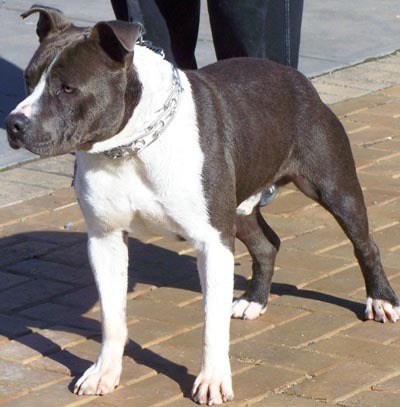 American Staffordshire Terriers come in many colors, including white, blue, fawn and brindle. Their coats are quite short and lies very close to the skin. What this means for owners is that they will not have to deal with too much shedding and their dogs will always have a smoother feel than a lot of other breeds. A common misconception when it comes to American Staffordshire Terriers is that they are passive and aggressive by nature, but that couldn't be further from the truth. AmStaffs absolutely love people and enjoy running around and playing more than a lot of other breeds. Yes, they were originally brought up to fight over 100 years ago, but they now have a much calmer nature and are fantastic family pets. 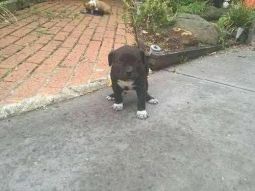 American Staffordshire Terrier puppies need to be socialized early so they know to respect other dogs and people. While they are very loyal by nature, they usually have no problem going up and playing with new people they are introduced to. They are chewers, so even from an early age they need to have toys and bones so that they can get their chewing fix.AmStaffs are great with children because of their playful nature. They are extremely powerful, though, so kids should be warned not to get into wrestling matches with this breed. Other than that, AmStaffs love to snuggle and run around with kids until their hearts are content. 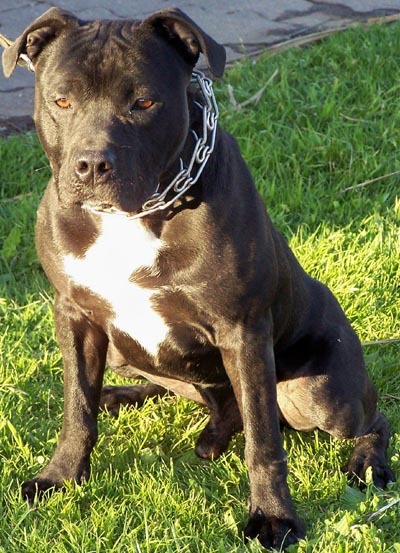 By nature, the only times AmStaffs become aggressive with other dogs is when they feel threatened or if they feel that their owners are in danger. This can easily be trained out of them, though they will react aggressively if they are attacked.American Staffordshire Terriers are some of the best guard dogs because they have a great instinct for when danger is around the corner and they have a tendency to scare off intruders. They take protecting their owners very seriously, so most owners feel very safe with this breed in their homes.It's okay to leave an American Staffordshire Terrier alone at home, but they will develop emotional problems if they aren't treated as a member of the family. They feel incomplete without interactions with their owners, so they need as much attention as they can get. While AmStaffs are very trainable, owners need to know before they get one that it takes some time to initially get through to them. The earlier the training process begins, the quicker these dogs understand that you are the teacher and they are the student. Giving them treats when they learn something new will definitely get a better reaction from them than treating them harshly when they fail to grasp something. While it may be a little tough to get through to them in the initial rounds of training, once they realize that learning new commands makes you happy, they are quick and eager to learn more. It also doesn't hurt that they know they will be rewarded when they learn new things.This is one of those breeds that gives owners a very rewarding feeling when they finally start learning new commands and tricks. It's not that they are a hard breed to train, but early on it can seem like it's going to be impossible to get through to them. A little patience and a lot of repetition gets the job done, though. 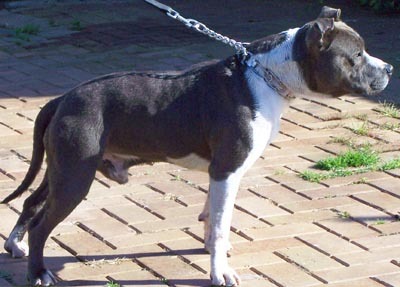 Dogs that have muscles like American Staffordshire Terriers need to be worked out a lot. This is key to their health and happiness, so one long walk or multiple runs per day is required. While they can live long, happy lives in smaller homes, it's often recommended that they live in a house with plenty of room and a large back yard for them to stretch their legs as much as they can.Some AmStaffs are naturally very good on walks, but others need a lot of training so they know when to heel and when they can walk in front of you. They love their walks, so if they know they are doing something wrong while they are exercising, they will usually learn quickly to do whatever it takes to make their walks and runs as enjoyable as possible. American Staffordshire Terriers are okay with walking with other dogs as long as they have gotten to know the dogs they are with. While a well-trained AmStaff will get along with most dogs, some will not react well to foreign dogs taking over their space. There aren't too many breeds out there that are easier to groom than the American Staffordshire Terrier. The only issue people sometimes run into is that their AmStaff isn't used to being groomed so they are uncomfortable with it. This is why owners need to groom them early on in their lives so they know there's no reason to be afraid. AmStaffs shed once or twice a year, but even when they do it's not very much fur at all. Brushing shouldn't be done too often, but once a week or every other week will keep their coats looking and feeling great. Nasty bacteria love this breed's mouth, so owners should brush their teeth at least once per week to keep their breath smelling fresh. This is something that needs to be introduced early on to keep them from squirming.While it's good to clip nails that get too long, AmStaffs usually do this on their own if they are exercised the right amount. Of course, if their nails start making noises, you need to clip them so they don't get uncomfortable. AmStaffs usually live between 10 and 14 years, with some living a few years beyond that. Two of the most common health issues with this breed are heart disease and cancer. Mental and physical health can be kept at a high level if American Staffordshire Terriers are kept on a good diet and get the exercise they require. An American Staffordshire Terrier can be someone's first dog as long as they are well educated on how to take care of one. 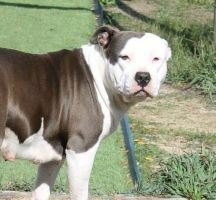 Anyone who loves dogs and wants to bring an AmStaff into a loving home would be great for this breed. People who love to go outside with their dogs often are perfect AmStaff owners because these dogs love to interact with their owners in big spaces. You won't see a happier dog than an AmStaff that gets to run around and play on a regular basis.It's also a good idea for AmStaffs to go to people who are going to be patient with them. While they are very smart dogs who love to please their owners, it definitely takes a little time to get through to them. A person who is willing to wait them out would be perfect. Some people get AmStaffs just to own a dog that has a reputation for being aggressive and for being a great guard dog. It's a bad idea for these types of people to own an AmStaff because they usually don't realize how much work it takes early on to get them to a place where they are good social animals.People who already have other dogs in the house probably should not adopt an American Staffordshire Terrier because they need time early on in life to become used to new dogs. While it's possible for them to come into a new environment and be great with everyone and other dogs, there's always a chance that they will get aggressive when they feel that other animals are taking over their territory. Anyone who has a schedule that will regularly keep an AmStaff at home alone is not a good fit. They will become reckless and will not be happy pets if they are denied the chance to be around people and exercise on a regular basis. It's unfortunate that American Staffordshire Terriers have such a bad reputation because they are a great breed that just require good owners to get the most out of them. They can be some of the happiest dogs in the world because they naturally love people and will do anything to please.